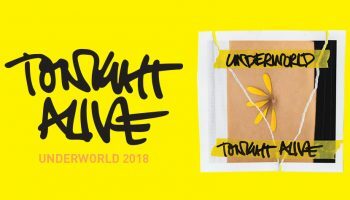 Interview: Dan Flint From You Me At Six – Spotlight Report "The Best Entertainment Website in Oz"
British rockers You Me At Six are heading back Down Under alongside Australia’s Tonight Alive in September, to play their first headline tour in support of their new album Cavalier Youth. 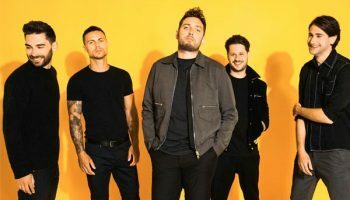 Thanks to Soundwave Touring, we had a chance to speak with the band’s drummer, Dan Flint, about the tour, making the new album, being featured on the latest Fifa game, and much more. 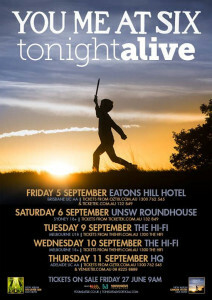 SR. You guys will be coming to Australia soon to play with Tonight Alive . How are you guys getting ready for the tour? DF. We’ve been doing a lot this festival season, this summer. Flying in and out of European countries playing different countries. Belguim, Holland, Austria and Latvia, Poland and all these crazy places. Eastern Europe. SR. The guys from Tonight Alive say that you are one of the biggest influences for them. Now you are touring together so how do you bands get along? DF. We get along really good with them. The first time we met them was on Warped tour in the US. We sort of became friends with them purely because of the fact that there was a lot of Americans on the US tour obviously and we were English and they’re Australian and we felt like we had a bit of a connection. We were the outsiders who weren’t American. The Commonwealth thing came into it. We felt like we were from similar places cause England and Britain have got that connection with Australia .We like the same things, we used to go out and play football together, hang out having a few beers , listening to some music. It was very easy to become good friends with them. SR. That’s cool man. 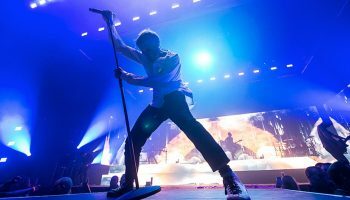 Compared to previous tours, like touring with Paramore, what can Australian fans expect that’s different from previous tours? DF. This will be the first headline tour that we’ve done since releasing Cavalier Youth, our latest album, so we will have the opportunity to play new songs and will throw in some old ones as well. Some that we’ve never played before in Australia which will be really fun. Some golden oldies and were going to make sure it’s a really good set. It just flows nicely, there’s a lot of audience participation. People are up on their feet the whole time, singing along. It’s a set where the crowd feels really involved with the band. Australia’s usually one of the best places we play. SR. In the Cavalier Youth album, the lead single ‘Lived a Lie’, was featured in one of the FIFA games. So I was wondering if you are a soccer fan? DF. Yeah we are huge soccer fans. We are playing FIFA all the time especially when we are on tour. We are always in the back lounge of the bus or make sure we have a copy of the game. SR. That’s awesome man. What team do you support? 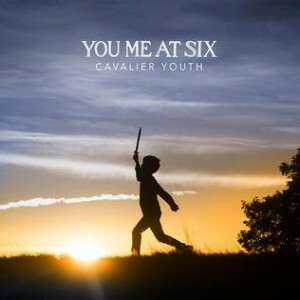 SR. From the Cavalier Youth album which is your favourite song and why? DF. It changes but at the moment I think I’m really enjoying playing Forgive and Forget. Because we’ve been doing festivals its quite a festival sounding song. There’s some big parts of the song where the crowd gets involved. It goes down really well and I’m quite excited to play it at Reading and Leeds festival cause its going to be one of the highlights of the set. Its different from us. SR. How many songs are you planning to include on the setlist from the new album? DF. It’s going to be old songs and new songs . We don’t like it when bands release a new album and they only play songs off that new album. We play all the songs that people want to hear. Some may not have even bought the new album yet or heard it. We want everyone in the room to have an amazing time so we will play some of the new and play a few from every album. SR. 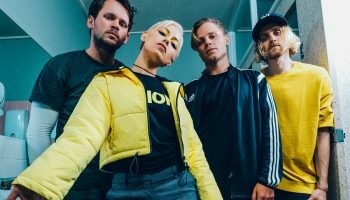 Being the first headline tour in Australia with Tonight Alive, is there any chance of the two bands jamming onstage together or playing any Australian rock classic, like ACDC? DF. Yeah it was cool, really cool. SR. Do you have any funny or weird story involving a fan with the band that you could share with us? DF. We’ve had a few strange experiences with fans. One of the coolest places we’ve ever been is Japan. I think it’s because of the fans. It’s not because of one individual fan. As a group of fans they’re a very polite people. SR. Do you guys have any pre-show routine? DF. Yeah we do. We get into a huddle, us five and we talk about everything that going on. We talk about what we are doing for the set, remind each other about moments Say if the day before there was a couple of things that went wrong, we will talk about that and say make sure you do this, this and this. Then we will have a joke around, sing a song , or just make jokes at each other and just be stupid. Get everyone pumped up for the show. Make sure the energy levels are really high before walking out on stage basically. SR. Would you like to send a message to your Australian fans? DF. Thanks to everyone that’s coming out to the tour really. It’s making it such a huge success. Australia is one of my favourite places to come in the world and we can’t wait to come back so see you in a couple of weeks. *For Brisbane ticket holders there will be limited free shuttle buses running from the city to the venue and returning after the show. More details to follow!